The SiteCozy broken link scanner allows you to check URLs from web pages and get a report of 4xx and 5xx errors, timeout errors, redirections loops, redirection abuse, mixed HTTP content errors, SSL certificate errors, malformed URLs. The SiteCozy broken link scanner checks URLs inside the HTML code: AHREF attributes (links), IMG SRC attributes (images) and IFRAME attributes (Iframe links). For every link, the crawler will follow a link even if there are multiple 301 redirects behind it. Note that this crawler also checks HTTPs mixed content error when the main page protocol is HTTPs and when an Image URL or an Iframe URL is HTTP. 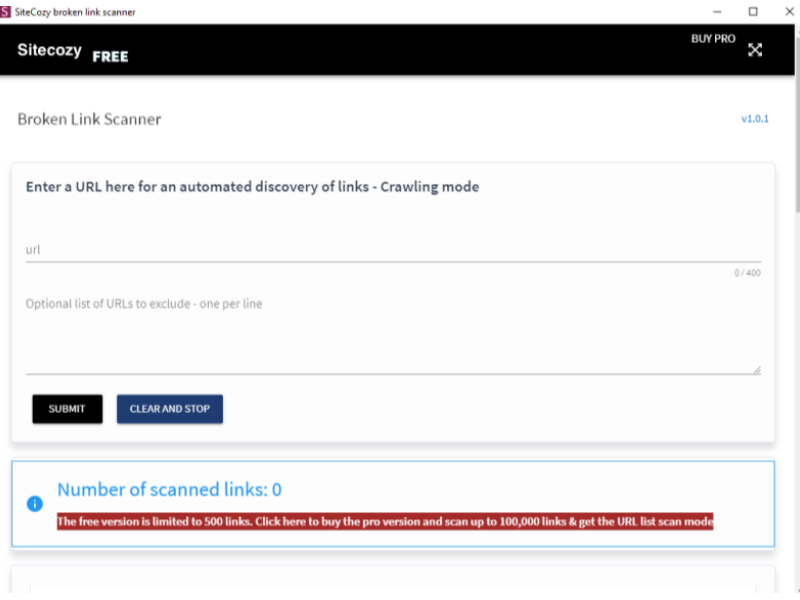 The Sitecozy broken link scanner automatically detects internal URL links on a webpage and visit all URLs on a domain up to 500 links in the free version. You can exclude internal and external URLs if you want to prevent the crawler to visit some URLs. This software checks if the external links work. However, it does not follow the internal links from an external domain. In the report, it is possible to click on the URL from the host page that contains the error and a new window of your favorite browser will open. It accepts subdomains and also URLs from the intranet. The Free version is limited to visiting 500 URLs including URLs links to web pages, Image URLs and Iframe URLs.